Basketball is a popular sport that many of the United States people love to play it. 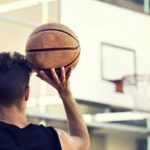 Many people take part in organized games and the surprising fact is that basketball is a sport that can easily be enjoyed even in the backyard of a home if you just know the basketball equipment checklist. Unlike sport fishing or mountain climbing, the checklist of this popular sport is not so long and you won’t have to break the bank to complete that short list. After picturing the different types of basketball hoops, today, we’ve represented this checklist for you. The first thing to start playing the most favorite basketball is the ball. The ball for this popular sport comes in different sizes and colors and of course with different qualities. But, a good ball always offers comfortable grip, good bounce, no leakage and pleasure for months after months. You’ll get two types of basketballs out there in the market. One is suitable for indoor and the other one is best fit for the outdoor court. It’s always suggested to buy an outdoor ball, because it lets you to play both indoor and outdoor and also these balls are long lasting and tolerant enough to withstand the concrete, blacktop surfaces, pebbles and rocks that are constantly found on outdoor courts. But, if you like to buy a ball for your kids who are too young to play in the outdoor, then you should go for an indoor basketball. As you know, the basketball is usually made of synthetic material, rubber or leather. Leather balls are expensive. So, if you’re looking for a good basketball at a budget price, you may go for a rubber ball. Rubber balls are durable enough though they aren’t as expensive as leather balls. You’ll be happy to know that every ball has these common features weather it is cheap or expensive. These common features are: the threading of the ball, the bladder, the cover, the channels and the carcass. And, about color, I always suggest you to go for your favorite color. My favorite color is blue. But, you’ve to clean your ball everyday if you choose this color. Basketball backboards essentially comprise a backboard and a basketball hoop. They are most typically used for shooting practice or for small games such as one on one. They come in a couple of different main styles with the first of these being a wall mounted backboard. There are models of this type that can be used both indoors and out, although both are basically set up for mounting on a wall. These can be on a door or wall and these are typically smaller models. An example of this is the Pro Mini Shatterproof Basketball Backboard from SKLZ. This has an 18 inch by 12 inch polycarbonate backboard and a spring action breakaway steel rim. It is supplied with a 5 inch rubber basketball and is ideal for indoor use in a kid’s bedroom. Outdoor wall mounted basketball backboards are of a size that is more akin to a full size court and can be used with a regulation basketball. They are designed to be fitted on the side of a building in a yard or garden to provide a place to play and practice basketball. This type of backboard has a breakaway hoop enabling slam dunks to be played without worrying about damaging the hoop. 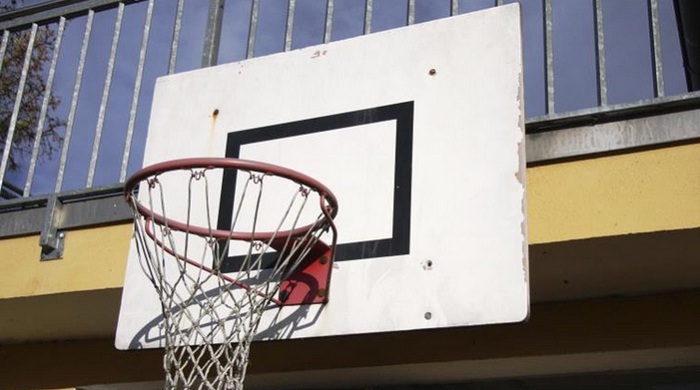 Another style of basketball backboard comes mounted on a pole. This is a more portable style of backboard which can be moved around as required rather than being permanently fixed to one position. If you need the requirement to move a basketball hoop around then a pole mounted backboard can be a more appropriate choice. The pole on which the hoop is mounted is more like telescopic and a few of them have easy height settings. The hoop can be set up anywhere with required installation and is an excellent choice for street games or for shooting practice in a garden or backyard. If you or your child enjoys playing and practicing basketball, then, basketball backboards are a must have accessory to add to your home. Whether you use a wall mounted or a pole mounted model, they provide the opportunity to throw some baskets and get some exercise in the comfort of your own home. It is not a must for your home. But, as you know, many schools and other organizations have basketball teams which play in leagues and competitions. They will generally have a basketball court to host their home games and this can be fitted out with a range of accessories. One of these is basketball scoreboards and these are used to keep the watching crowd informed of the progress of the game as it is played. Basketball scoreboards can be found in a few different styles from basic to more sophisticated and both manual and electric models are available out there in the market. 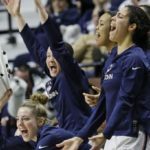 In its simplest form, a scoreboard for basketball can simply comprise a tabletop or floor standing flip board which is operated manually and shows the scores of both teams. These are typically the most affordable options and can be found on the market starting at a price of around $30 for tabletop models. 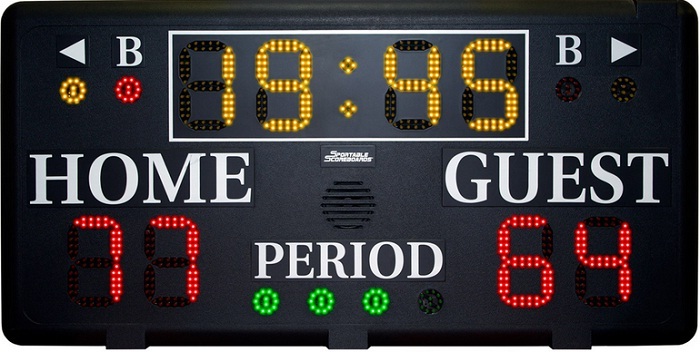 This type of scoreboard for basketball is portable and easy to move around as required. While manual basketball scoreboards are the simplest option available, for a more professional look, electronic scoreboards are the option to consider. These come in a variety of styles from smaller portable models to larger permanently fixed four sided scoreboards. While these show the game score they are also usually capable of showing a range of other information in relation to a game. This type of board can include details such as the period being played, the time remaining in a period, the shot clock, the team in possession and the number of fouls. The costs for electronic basketball scoreboards can vary widely depending on the size and the features included. Smaller portable models can be found on the market in the low hundreds of dollars. However for the larger single and four sided models which are capable of showing a range of information, the cost can easily rise into the thousands of dollars. Providing the watching crowd with information at a basketball game will help to keep them informed as the game is played. At a minimum the score is usually shown, although there is a range of other information that can be displayed. The simplest way to show this is basketball scoreboards and whether using a manual or electronic model it will keep everyone informed of the progress of the game. To bring a professional touch to your backyard or driveway basketball game, you can consider buying a manual tabletop scoreboard. Basketball is one of the most popular sports that is played from school children to the professionals. While many children like to practice in their backyard or play in street basketball, there are also many leagues and competitions played through schools and other organizations. This provides the chance for kids to play in a real game setting and also presents the opportunity to compete for basketball trophies. Basketball trophies come in a huge variety of shapes and sizes, providing those that need a trophy with a wide range to select from. Some of the typical examples include a small column or plinth with a basketball on top and in many cases this can have a wreath or some other decoration around it. Another common option is to have a column with a basketball player on top and the player can come in a variety of poses. Another choice is to have a cup trophy with a basketball themed logo on it. There are a variety of attractive basketball themed trophies available and they can be found in any reputed online retail shop. An online retailer that has a good range of basketball trophies available is Decade Awards. They have trophies in a wide variety of shapes and sizes from a fun style which is more appropriate for young children to crystal engraved plaques and column trophies with a figure or basketball. While there is a selection to choose from, it is also possible to build your own column trophy by choosing from the various different styles of columns and figures and this can also be engraved with a title of your choice. Most of the trophies they have for sale cost less than $10 to purchase making it an affordable retailer to choose. 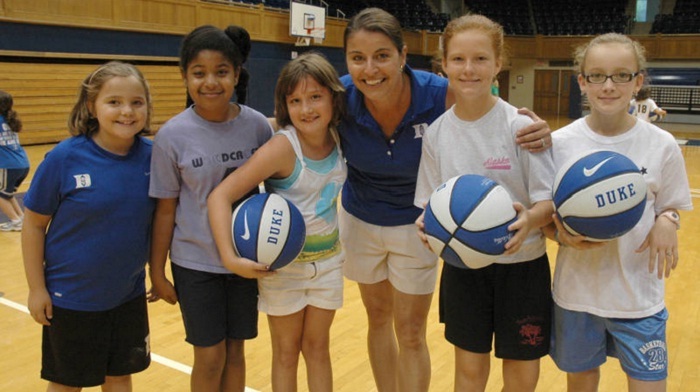 However, organized basketball can be a good activity for kids that enjoy the sport. It presents an opportunity for them to play for and win basketball trophies and this can be a good incentive. 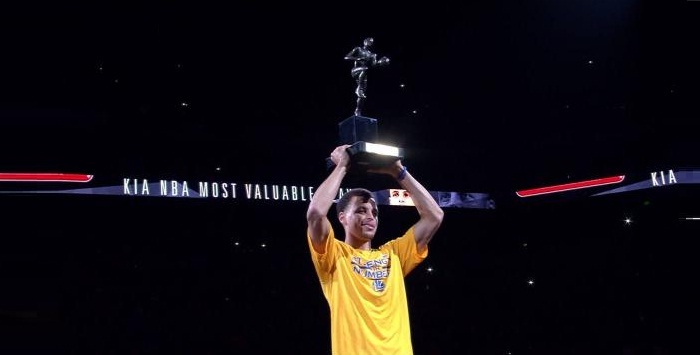 There are a variety of styles of trophies for basketball to choose from and whichever one is selected, it should be a great prize for the team that plays well enough to win it. Installing the right type of basketball court flooring for the type of court that you’re planning on installing in or around your home, is very important if you’re serious about basketball. You want to be sure that you have the right type of court, so that you’re able to play all that you want and also to ensure that you’re able to play with complete confidence. The wrong type of material can affect the way in which the ball will bounce, which can really put a strain on your ability to play basketball in the right way. For that reason, picking out the most ideal basketball court flooring possible is essential, and something that you always want to consider carefully. When you’re building an outdoor court, concrete is always going to be the way to go, so that you have a flat surface to play on, and one that encourages the ball’s natural bounce. What’s more with concrete is that you’re going to be able to ensure that you get all the protection that you need from bad weather, and other types of conditions. With the right type of floor like this, you’ll be able to ensure that you have the perfect place to play all the year. Although you will need to ensure that the foundation of your concrete is set properly, otherwise you can run into all sorts of problems with the material. Of course, you also want to be sure that you choose the right type of basketball court flooring if you’re going to be installing an indoor court as well. For this, you want to ensure that you have the same type of concrete foundation, to provide strength in addition to stability. But on indoor courts, athletes tend to do a little more training as well as preparation, and that means you want to have some more protection. With hardwood tiles, you can give them a little bit of cushioning, so that running up and down the court isn’t so hard on the knees or ankles. With the right type of snap together tiles, installation will be a breeze as well, and you’ll be amazed at just how fast your entire court can go together. Although, no matter what type of basketball court flooring you choose, you’re usually going to want to ensure that you have professional help in order to install it properly. That’s because you need all sorts of special tools to get the ground set up in the right way. You need to have certain things like a plate compactor, as well as gravel to actually ensure you have an ideally flat and safe surface for installing the concrete. The average person doesn’t have these tools just laying around, and only the right type of construction contractor is going to be able to aide you. That means you want to find the contractors in your area, so that you can find out what’s available for installing your basketball court flooring. By using a Google or Bing local business search, you can find out about the industry available where you live. That way, you can get a good reading of the prices you can expect from each company, so that you can find the most fair rate to provide you with the basketball court flooring you want, at an affordable price. 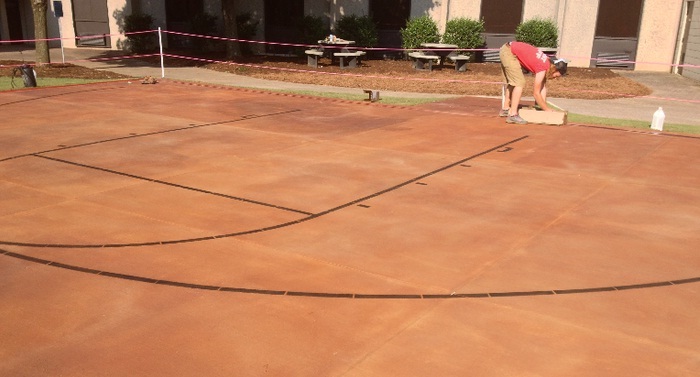 VersaCourt is a reliable company that can design and install an outdoor basketball court. They have a range of 12 different court sizes to choose from and these are constructed using a ¾ inch thick suspended surface. This has shock absorbing properties that help to reduce playing fatigue as well as providing excellent ball rebounding properties. It also provides a good surface grip making it easier to run and dribble as well as making it less likely that a slip will occur. If you’re a big fan of basketball and want to enjoy playing the game like the pro, then an outdoor basketball court is an option to consider. It can be a great addition to a home or commercial property and will provide you with a safe and suitable area where you can enjoy playing and practicing your basketball skills. Practice makes perfect in most sports and the more that an athlete trains the fitter and more expert they can become at their game of choice. This is as true in basketball as it is in any other sport and while working with a basketball is one of the simplest ways to practice, there is a range of basketball training equipment which can be used by players to improve their game. Basketball training equipment comes in various shapes and forms and most is generally aimed at a specific skill in the sport. Shooting in particular has a range of training equipment designed to help a player improve their shooting skills. A weighted basketball is an example of shooting training equipment and this is basically an oversized and heavier basketball which is more difficult to shoot into the basket. However, after using and becoming proficient with a weighted basketball, it will make a regulation sized basketball seem easier to handle and shoot. A shooting strap is another piece of basketball training equipment aimed at improving the shooting ability of a player. 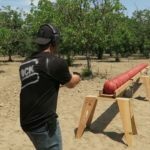 It is designed to force a player to shoot one handed, which is generally considered to be more accurate and more likely to result in points scored. The strap is fitted to the non shooting arm and restricts it from being used when shooting a basketball. This forces a player into developing a one handed shooting action and if used regularly to practice it can improve your shooting accuracy. A style of basketball training equipment that is designed to help with ball handling and dribbling abilities is the Naypalm. This fits around the hand and is designed to teach you the proper hand position on the ball. Typically the fingers should be used and the Naypalm helps to teach this as well as helping to strengthen the fingers and wrist when it is used. Wrist weights are also very effective piece of training equipment that can be used to strengthen the wrists, which in turn can help ball handling skills. Leg strength is another important part of being a good basketball player. A style of basketball training equipment that can be used to develop this is the Side Step. This basically comprises two padded ankle cuffs with an elastic strap connecting them together. When worn the elastic forces the legs to work harder as they move and this can help to improve your leg power. The Side Step can be found on the market for around $50. Practicing is an important part of improving at a sport and there is a variety of basketball training equipment that can be used if this is your most favorite game. 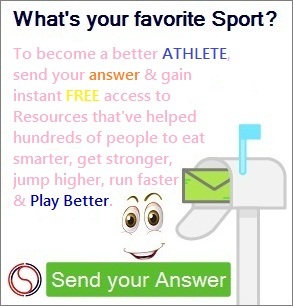 It can help to develop basic basketball skills as well as improve strength and fitness. Depending on what you need to improve in your basketball game, there is sure to be a training aid that can help you. When you want to take your ability to play basketball to the next level, you need to have the right type of basketball training equipment. Only with the appropriate training equipment, you can be sure that you’re able to take your game to the next level. It’s just a matter of picking out equipment that’s designed to aide you in every aspect of your game. There’s a lot of basketball training equipment out there, and it’s just a matter of picking the items that you know are going to make you a better player as quickly as possible. Another very important basketball equipment checklist is net. In basketball, all hoops need basketball nets. While this isn’t exactly a necessity, as the hoop is more important, but if you want to truly replicate the NBA feel, you need a basketball hoop net. There are a lot of different basketball net types as well, depending upon your unique tastes for the style of your hoop. There are chain basketball nets, as well as nylon basketball nets, and even custom color nets. The options are limitless, and choosing the right one is as simple as finding out what’s most important to you. 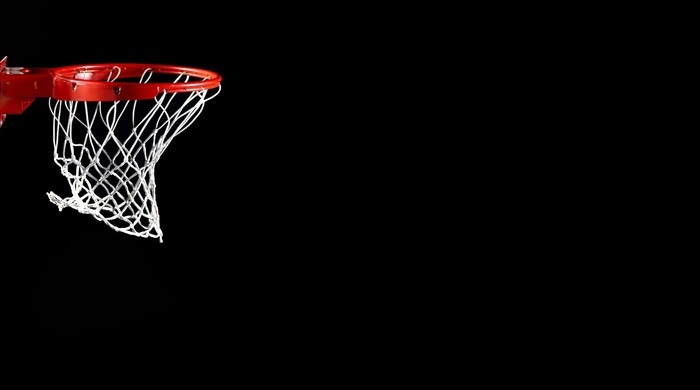 If you would like to add basketball nets to your court, that are as close to regulation as possible and there are a few governing rules you’ll have to follow. Both the NBA and NCAA follow essentially the same rule standard regarding how the basketball goal net should be handled. Every one must fall between 15 and 18 inches in length. Also the material has to be nylon, and the bottom opening of the hoop has to be smaller than the top. The top needs to easily accommodate a standard hoop’s 18 inch diameter. This controls the ball’s exit so that it can be easily grabbed from underneath the net after every basket. Although when outside, the outdoor basketball nets commonly used can also be made from metal chains. This is much more durable, and means your net will stand up to the weather elements much better, but they are not allowed in competition. But metal basketball nets do stand up to rain and harsh weather the best. Also they give the court an urban feel like a nylon net just can’t. However, they can also be dangerous as players are attempting certain moves like dunking the ball. There is a risk that your hand, or fingers could get caught in the chain basketball net, which can cause severe injury. Nylon doesn’t have the same risk because the material is more flexible, and much harder to get caught on. You can even customize the color of your basketball nets, if you choose nylon material. There are white basketball nets in classic form to replicate the professional atmosphere of the NBA. Also there are nets that provide a little more visual flair with color combinations like red, white and blue basketball nets. 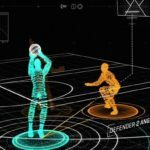 You can also find glow in the dark basketball nets, although playing basketball at night may be too difficult to really enjoy the experience. There are even black nets which act about like chains to make your hoop have a more urban feel. Color usually doesn’t affect price, it’s just a matter of finding the net that’s most visually appealing to you. You may play basketball with barefoot at your home. But, shoes and clothes are must if you like to practice basketball in a club and you won’t be allowed to any basketball tournament without required wearables. Moreover, jersey of your favorite basketball team can bring extra pleasure to your afternoon game. Actually, it isn’t impossible to play basketball without these things, but, to make your game more worthy of remark, basketball shoes and clothes are must. This basketball equipment checklist is designed mainly for the beginners. 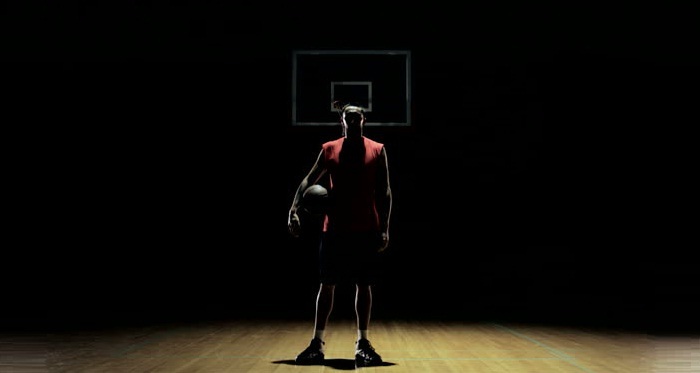 So, it may seem incomplete to you, if you’re a pro basketball player. If you like to play just like the professionals, then you can also consider Ankle Stabilizer, Basketball Knee Pads, Portable Basketball Backpack Mesh Holder, Training Markers, Ball Return System, Basketball Trainer for Offensive and Defensive Drills, Finger Spacer Sleeve and of course a ball. It’ll be my pleasure, if this checklist will be of any value to you.